I am a pet lover especially I am crazy for cats but I also love dogs very much l! I cannot have my own because I keep traveling and they would suffer. This is why I love to take care of others so that I can live close to them every now and then. I need pets in my life. I used to have 1 cat years ago. I adopted her from the road when she was old and sick and look after her until she died. Then I adopted 2 little cats brother and sister when I rescued them from the streets, adorable . It was difficult to let them go but I found a lovely family for them and made sure they are happy now. 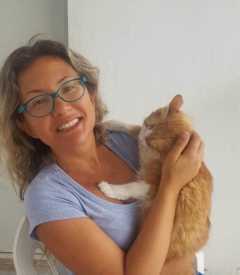 Trustable and loving pet sitter! I am very flexible and adapt to the need and habits of the pets. I can either stay in the house or go back and forth to visit them. Whatever they are used to I will do the same. They need to feel as if nothing has changed . Isabella's Pet House Sitting service is located in or nearby San Luis Potosi, San Luis Potosi. Book via PetBacker for Insurance, Payment protection & 24x7 support.